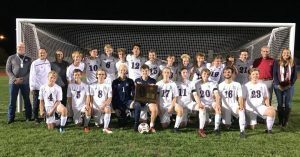 Gibault topped Springfield, 2-0, on second half goals by Cam Kincheloe and Logan Doerr to win the Class 2A Chatham Glenwood Supersectional on Tuesday night and advance to this weekend’s state soccer tournament at Hoffman Estates. This is the third straight state tourney appearance for the Hawks, who lost in the title game last year in their first season at the Class 2A level. Gibault placed third at the Class 1A state tourney in 2016. Gibault will face Crystal Lake South in the state semifinal at 1 p.m. Friday. Tuesday’s contest was scoreless at halftime despite Gibault controlling much of the early action with the wind at its back. Going against the wind in the second half, Kincheloe’s goal at 48:26 was assisted by Karson Huels, who also assisted Doerr’s goal with just seven minutes remaining in the contest. Huels, who has 15 goals and 17 assists on the season, was named Friday to the Illinois High School Soccer Coaches Association All-State Team. Doerr, who was named to the IHSSCA All-Sectional Team, leads the team with 22 goals and 14 assists. Both are seniors. Gibault topped rival Columbia, 2-1, on Saturday to win a sectional title. For a recap of that game, click here. For photos from Saturday’s sectional title showdown, click here.